A quirky, intensely intimate, totally captivating story about love, marriage, “yellow fever”... and documentary filmmaking. 237 backers pledged $24,200 to help bring this project to life. We've made our goal with time remaining! THANK YOU ALL SO MUCH!!! So what happens now? Stretch goal: $25,000! seeking asian female is a feature-length personal documentary about the unlikely romance of Steven and Jianhua (a.k.a. “Sandy”) - an American man who is obsessed with marrying any Asian woman and the Chinese woman half his age who agrees over the Internet to be his fiancee. Debbie, a Chinese American filmmaker, documents with skepticism and humor, from the early stages of Steven’s search, through the moment Sandy steps foot in America for the first time, to a year into their precarious union. From one unexpected turn to the next as these two online pen pals attempt to overcome vast differences in age, language and culture for the sake of a real-life marriage, the filmmaker gets pulled deeper into their story. And as her role morphs from documentarian to translator to couple’s counselor, this roller coaster relationship becomes more intimate and more human, ultimately becoming a strangely compelling love story for the ages. Like the story itself, the making of this documentary - in true indie fashion - took many twists and turns. What started out as my own personal quest to figure out why it bothered me so much that certain Western men have “yellow fever” (i.e., a romantic fixation, obsession or fetish for Asian women), grew into a much bigger exploration into marriage, immigration, language and communication, Sino-American relations, subjectivity versus objectivity in documentary filmmaking -- and the really big one: love. As you may have guessed, it’s been years in the making! For the first few of them, I borrowed equipment, spent my savings and doggedly interviewed dozens and dozens of men who posted online personal ads exclusively seeking Asian women through websites like Craigslist personals and Asiafriendfinder. I followed a matchmaker and recent immigrant from Beijing who specializes in introducing immigrant Asian women to American men in Silicon Valley. I interviewed experts and academics, poets and activists, and men and women who had very strong opinions about this ever-growing cultural phenomenon. But years later when Steven, who was one of my early interview subjects, actually found Sandy, and she agreed to let me film her, everything changed. First I jumped into to what was obviously going to become a new and different film. Then for the first three months of their relationship - which was also the first three months of Sandy’s life in America, I practically lived with them as I observed whether or not Sandy would marry Steven before her 90-day fiancee visa expired. I wanted to understand what were Sandy and Steven’s real motivations to make this relationship happen? I went on to film another year and a half, and in the end, all of my expectations about them and the film I had intended to make were shattered. At this point, many years into production, I also finally received my first grant - from the California Council for the Humanities (Cal Humanites). Since then I’ve been supported by Chicken and Egg Pictures, the Center for Asian American Media, Women in Film Foundation, ITVS and KQED. The truth is, the hard work of seeking asian female continues...and we still need to raise the final 20% of our budget in order to ensure that the film makes its way to YOU! Revise titles, subtitles, credits, voice-over, sound mix and online. By backing our project, you will be instrumental in helping us complete our one-hour broadcast version AND to express our deepest thanks we’re offering you a chance to see the 84-minute director’s cut, before the broadcast next year. When you join our kickstarter, you will be an investor in the film’s future. The one-hour broadcast version will allow us more opportunities to show the film to many different people in many different communities - and for example, can be used in schools and universities and other environments for learning. Many of you have already helped us along the way, and we want to thank you for your ongoing support. Every little bit helps, including telling all your friends how much you love our project too! All of us here from the SAF team want to thank you for considering our kickstarter campaign. We are very excited about our film. We want you to see it. We want the world to see it. Please help us get it out to more audiences! Pledge today at $50 or above and you don't have to take their word for it - you can see the film for yourself! One - 100% cotton t-shirt, hand-painted with original Chinese watercolor design by Debbie's Uncle Peng Tzu, and One - Pre-Release DVD. Make a point with our set of 3 buttons! 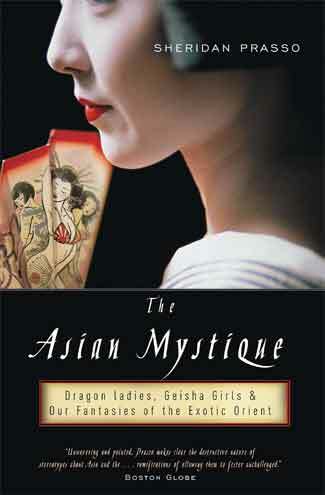 "The Asian Mystique" by Sheridan Prasso! Autographed and Out-of-print hard cover! Original "Seeking Asian Female" poster - signed by Debbie Lum! Thank you to everyone for all of your support! We couldn't do this without you! IT'S A WRAP! *** NEW REWARD *** Attend the official 'SAF WRAP PARTY' in San Francisco including a PRIVATE PREVIEW SCREENING and celebration with the director, producers, crew, funders and supporters of seeking asian female. Date & Location in San Francisco TBD - but we are aiming for one evening in August or September 2012. BRING A DATE to IT'S A WRAP! *** NEW REWARD *** Save $10 and get two tickets to the official 'SAF WRAP PARTY' in San Francisco including a PRIVATE PREVIEW SCREENING and celebration with the director, producers, crew, funders and supporters of seeking asian female. Date & Location in San Francisco TBD - but we are aiming for one evening in August or September 2012. UNCLE PENG TZU'S GIFT (Color) *** NEW REWARD *** Beautiful hand-painted t-shirt with original classic Chinese water color design by Debbie's uncle! Men's large, assorted designs (grab bag selection). Comes with a pre-release DVD of director's cut. UNCLE PENG TZU'S GIFT (B/W) *** NEW REWARD *** Beautiful hand-painted t-shirt with original classic Chinese water color design by Debbie's uncle! Men's large, assorted designs (grab bag selection). Comes with a pre-release DVD of director's cut. SEEKING ASIAN AMERICAN FEMALE ARTIST *** NEW REWARD *** Jeri Au, one of Debbie's favorite Asian American female artists from her hometown St. Louis, Missouri, has generously donated an original piece of her ceramic art. Standing 15" tall, this one-of-a-kind three-dimensional form made of clay, is sculpted and glazed into a work of gracious and whimsical beauty. The list price for this is $1200. If you pledge $800 or more, we will ship this to you (in proper packaging with insurance) along with our pre-release DVD.